It provides the same type of ski exercise as the basic ski machine but is further upgraded with the revolutionary ST Control Computer that gives you additional information on the quality of your ski technique through an touch-screen LCD. The standard machine is best suited for experienced skiers. The ST warns the user of incorrect ankle, knee and hip postures. The ST monitors you every step of the way and provides audible warnings for incorrect ski turns. The machine will help you refine your stance and optimise the pressure you apply to an individual “ski” as you go and exit a turn. 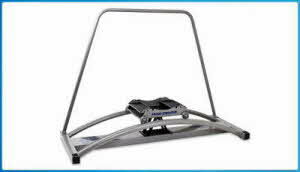 This is the standard model but featuring in addition a revolutionary frame that enables the ski machine a perfect ski simulation of a carving turn. It was designed especially for excellent skiers and competitors. Because of the outstanding simulation of ski turns you will feel as if you are on an actual ski slope. The machine is best suited for physical and technical preparation for the competition season. 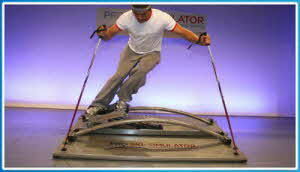 No other ski equipment of this type is able to simulate actual skiing that well.